Studhubs and I recently went on vacation to Myrtle Beach, SC. When we go to the beach we really don't plan on doing much more than sitting on the beach, swimming in the waves, reading books, and evenings in the hot tub. *sigh* I LOVE the beach. However, the one thing we do enjoy doing while we are there is finding some great, locally owned places to eat. On our first night there Studhubs requested pasta, so we went on the hunt for a great Italian place to eat. 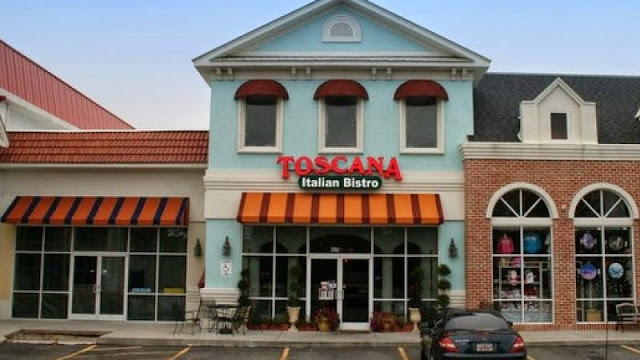 What we found was this great little place, tucked away on N. Kings Hwy, called Toscana Italian Bistro. It was a BEAUTIFUL little place! Our service was outstanding, and the food, oh my, the food was amazing! While I was there I had Penne alla Vodka. I had never tried this dish before, but I was SO glad I did. It was delicious and I knew instantly that I had to try and recreate this recipe as soon as I got home! The result was divine, and I can't wait to share it with you! One of the things I love about this dish is that in the time it takes for your pasta to cook, this meal is ready! First things first, get a pot of salted water on to boil. The reason you salt the water is because this is the ONE and ONLY opportunity you will have to season the pasta itself. Next up, get a deep skillet over a medium/high heat and add 2-3 tbsp. of extra virgin olive oil. While the water is coming to a boil and the skillet it heating up you can prepare the onion and garlic. I used a red onion here, but you can use any that you have on hand. Once the skillet is hot add the onion. You will saute the onion until it is soft and translucent, about 2-3 min. Once the onions are softened you can add the garlic. Cook the garlic until you smell it coming from the pan. 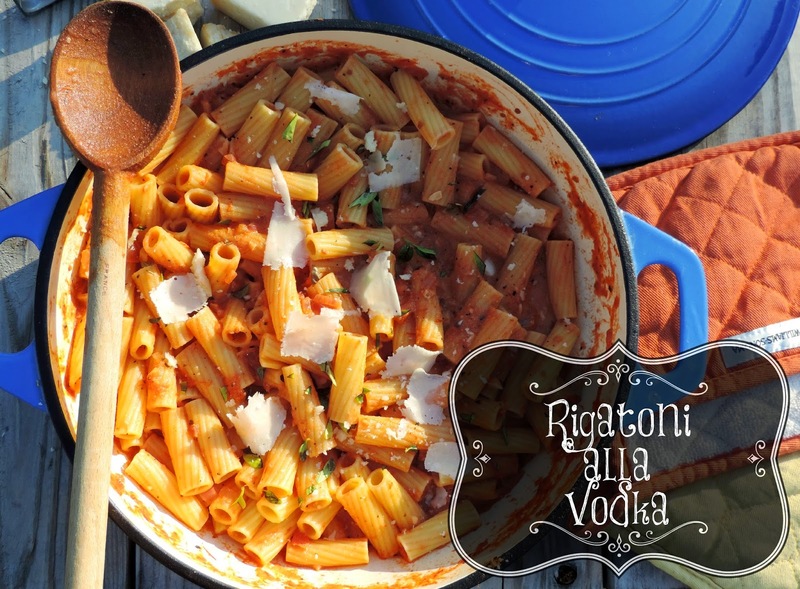 Since this is Rigatoni alla Vodka, vodka is obviously in the ingredients. Aside from the occasional glass of wine, I am not a drinker, but I was able to purchase this small bottle for $4. You can keep it fresh in your freezer, and I assure you that you will be making this again! If you are concerned about serving this to your children, let me assure you that the alcohol cooks off, but if you are STILL concerned, you could simply omit it. I think this dish will be delicious either way. Add the vodka to the onion and garlic mixture and allow it to cook 3-4 minutes to allow the alcohol to cook off and reduce. Now it is time to really start building our sauce. Add the can of crushed tomatoes to the pan. I like using crushed tomatoes instead of pureed because it gives the sauce a little more substance, but if you have a jar of sauce or puree at home, use that. It will be just fine. At this point you should by able to add the pasta. Cook according the directions on the package you are using. Let's turn our attention back to the sauce. Now it is time to season. Allow the sauce to simmer for about 10 minutes. After 10 minutes, add the half and half to the sauce. Along with the Parmesan cheese. Mix everything together and taste for seasoning. Make any adjustments you feel it needs. The pasta should be ready so add it to the sauce. Mix everything together until all of the pasta is coated with sauce. I like to top it with a little fresh basil and shaved Parmesan. I was so proud of this dish because believe it or not, it was SPOT ON to the one we had in Myrtle Beach, and we are excited that, though we can't be at the beach all the time, we CAN have a little of our vacation here at home. Give this simple pasta meal a try tonight! I know you will love it! And if you are in the Myrtle Beach area give Toscana Italian Bistro a try! You won't be disappointed. Bring a pot of salted water to a boil. When the pasta comes to a rolling boil add the pasta and cook according to the instructions on the box. Place a deep skillet, with 2-3 tbsp. of olive oil, over a medium/high heat. Prep the onion and garlic. Add the onion to the skillet and cook until soft and translucent. Add the vodka and cook for 3-4 minutes until it is reduced by half. Add the salt, pepper, chili flake, brown sugar, and basil. Stir it all together and simmer for 10 minutes. Add the half and half and the Parmesan cheese. Stir together until everything is mixed together. Add the cooked pasta to the sauce and toss until everything is coated. Top with some fresh basil and shaved Parmesan.